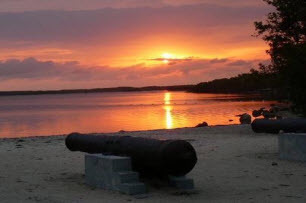 John Pennekamp Coral Reef State Park is a great camp-site which has forty seven pitches for RV's and tents. All of them come with electricity and water, with the electricity ranging from 30 amp to 110 volt. Plenty of power for all your home mod-cons. Each site has a table outside for your picnics, and a convenient grill for cooking your burgers and sausages. Also available is a dump station to get rid of all the stuff that.......ok, I think I don't have to say any more on this subject. The largest of the restrooms at Pennekamp Park has well maintained and clean toilets and hot showers. All of them come fully within the guidelines that are set by the A.D.A. Pets are allowed and actually welcomed in the camp ground, but you must be sure that your pet is able to behave itself. Sitting next to the group camp-site the Pond Restroom, has a private family bathroom. Which once again is fully ADA approved. If you want to do some washing whilst you are on the site...kids can get messy just sitting doing nothing after all, there are washers and dryers at the main restroom. Make sure you have a collection of coins for both facilities. Anyone camping at the site can make use of the trips run daily out to the coral reefs. You can either watch the marine life through the glass on the glass-bottomed boat tour, or instead try some scuba diving or snorkeling. Maximum RV length: The vehicle cannot be longer than forty five feet. Reservations: Bookings can be made well in the future, actually up to eleven months earlier than visiting.